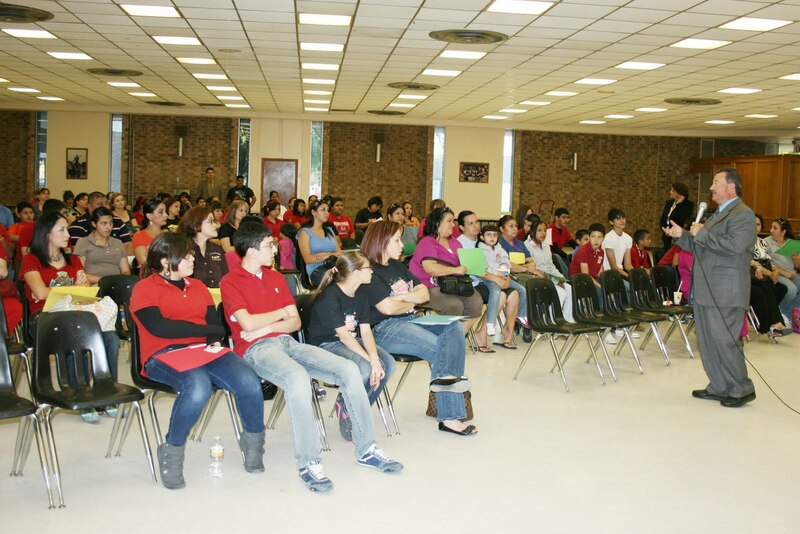 Rio Grande City High School Guidance and Counseling Department holds 8th Grade Parent Meeting. The meeting was geared at informing the parents of incoming freshmen about the course requirements for high school. They were also were made aware of the choices the students have available to them. Mrs. Gloria Smith and Mrs. Azalia Villarreal (Guidance Counselors) and Mrs. Agueda Garza-Career (Technology Specialist) were on hand to facilitate the information given to parents. Everyone was given a folder with details on courses which included a four year graduation plan. Information was disseminated on career paths and other pertinent information. Mr. Adolfo Pena RGC High School (Principal) welcomed the parents and thanked them for the dedication to their children. The guidance department will meet with students from Ringgold Middle School, Veterans Middle School and Immaculate Conception School during the month of April to assist them in scheduling the courses for next year. (RGCCISD Photo).